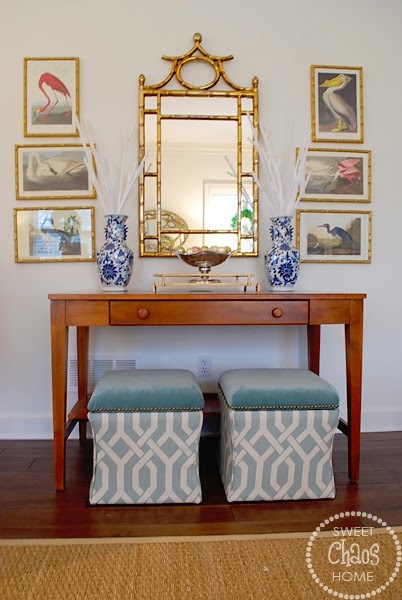 I loved the audubon prints and blue and white vases, but the mirror and storage cubes were only used because they fit my budget at the time. I already had the mirror, and the storage cubes were a Target bargain. But, I always envisioned replacing them with something better. 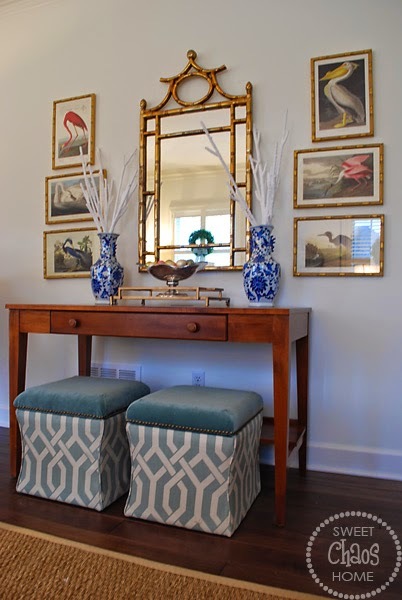 I found the chinoiserie bamboo mirror this past summer at an antique mall in Tennessee. It was a total score at $80! I've seen similar going for upwards of $900. The Target cubes got a facelift with new upholstery. 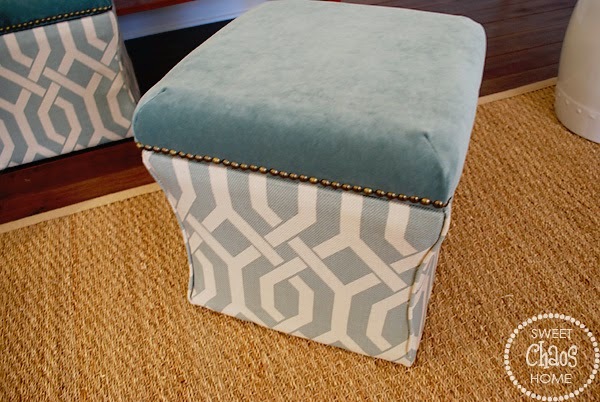 The geometric fabric was left over from my dining room chairs, and I chose a turquoise velvet fabric for the lids. I also had my upholsterer put better nailhead trim along the edge. The original nailheads were pretty cheap looking. I'm so happy with the way this little vignette turned out. I'd say it was worth the wait! i love it! that mirror is AMAZING and so perfect! Yes… it's a bit of a sickness! I moved the other one over my basement mantel. Awww… thanks so much, Linda! This area looks fabulous Carolyn! 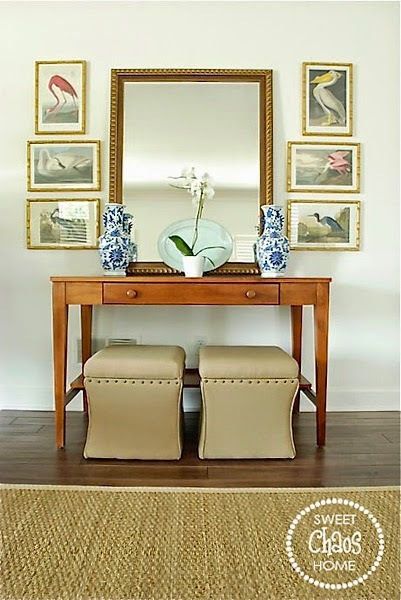 I love the way you transformed the cubes, and that mirror is gorgeous! You should be happy! It all looks beautiful! Goes to show what waiting for the right things can do! That is a lovely transformation! I love the mirror and what's even more interesting about it is you got it for only $80! That was a real bargain. I'm really amaze to see great updates done at a low cost. The Target cubes are also nice. Definitely worth the wait! I love the changes you made. Wow - what a deal on that mirror! I absolutely adore the mirror! What great changes you've made to that spot! This seat looks so beautiful.